With Zebras ZXP Series 9 you get the second generation of retransfer printers for printing cards in photo quality. In this innovative sublimation process, professional identity cards as well as money, customer or gift cards are printed single or double-sided with the landscape format mode at an impressive speed of up to 190 cards/hour single-sided. Thanks to the retransfer technology, cards are not only printed in borderless formats, but also in bright colours in colour printing mode and pin-sharp quality 12 dots/mm, 304 dpi. The advantage of this technology is less wear and tear on the printhead, which is why Zebra gives you a lifetime warranty for this consumable. The automatically applied carrier foil protects the printed image from abrasion or manipulation. Diverse card surfaces such as smartcards or non-PVC cards are professionally printed using this process and the intelligent media technology. 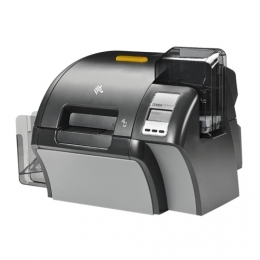 Customers use either the CardSense single option or the card feeder, in which up to 150 cards are automatically inserted. A 64 MB memory and a fast USB and Ethernet interface ensures smooth processing. The optionally integrated magnetic stripes, smart cards, or MIFARE card encoders additionally expand the functionality.